Being a professional... demonstrating the skills and knowledge which make you a professional social worker. Being professional in... how you make decisions and how you work across disciplines. Being active in practice... continuously developing skills and knowledge to update and improve practice. The PiP Framework has three Professional Awards which offer development opportunities for social workers with varying degrees of experience and responsibility. PiP Credit Accumulation allows social workers to gain professional credits for a broad range of learning and development which can be gained through taught or self-directed study. 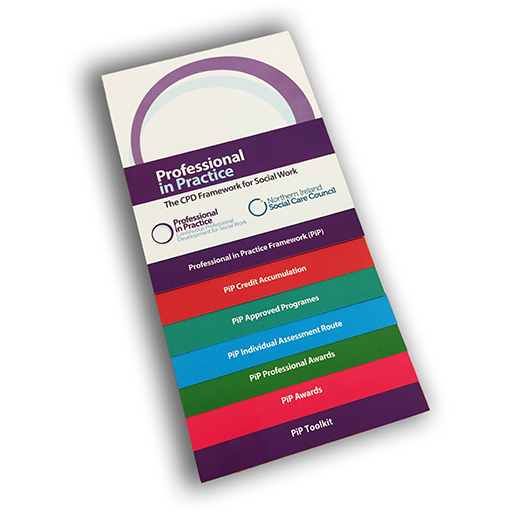 The PiP Framework offers access to a wide range of taught Approved Programmes which provide formal learning and development in a specific area of practice. IAR offers the opportunity to engage in self-directed professional development that does not involve formal teaching. Reflective Practice - A Model of Supervision and Practice in Social Work developed by Stan Houston, Professor of Social Theory and Social Work in the School of Sociology, Social Policy and Social Work, Queen's University Belfast.